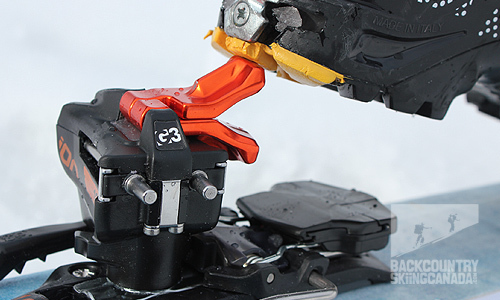 G3 hits a home run with the new Ion 12 Tech bindings. They’re the ideal combination of light weight and functional design with a good mix of innovative new features to keep you smiling on the up and the down. Not only are they from a Canadian company, but they're also super styling. Bravo G3!! Having skied G3’s first iteration of their Ion tech binding for the duration of last season, I can confidently say that I was impressed not only by the flashy appearance but also the great design. Hats off to local Nelson G3 engineer Cam Shute for doing such a bang-up job on them. The Ions are a huge improvement over G3’s Onyx binding, the release of which represented their foray into the tech market. However, as with any first generation product, there are always nuances that could use a little tweaking and the Ions were no exception. After 60+ days of skiing with the original Ion bindings, in the backcountry and at the resort in all sorts of conditions, I was able to thoroughly put them to the test. 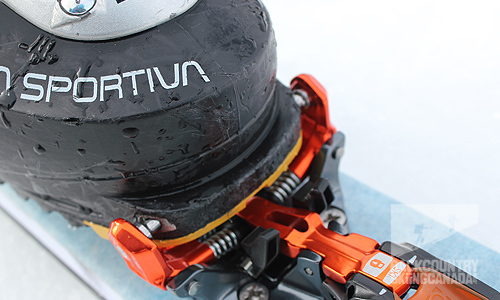 I found that they performed well and experienced only a minor occurrence of either of the issues being reported, namely the loose heel pins and premature deployment of the break and/or rotation of the heel piece back into ski mode. Have a look at the following video to better understand the two issues that some users encountered with the initial version of the Ion’s. - The toe piece has more clearance over the ski making it easier to self-clean. - Boot stops located on the toe piece guide your boot into the toe pins for easy in-n-out and they retract when in ski mode. - The heel unit is designed to accommodate fore and aft movement as the ski flexes. - Has a wider mounting pattern than other tech bindings on the market which is advantageous to today’s fatter skis, 30% wider in fact. - The heel piece rotates 360° for easy and fast transitions. - The risers can be employed from either the left or right side and don’t require the heel piece to rotate a certain way. We’ll discuss each of these features in the verdict section of this review (below) with some real world examples of why each one is so important to the success of the Ion 12. 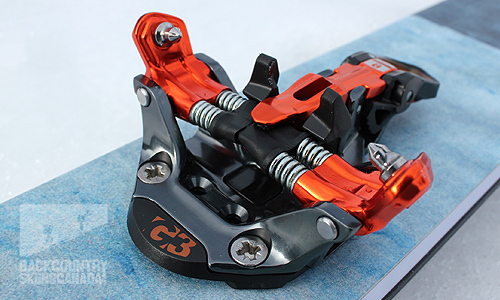 The toe piece is the traditional design with a few new tricks like better clearance and toe stops. 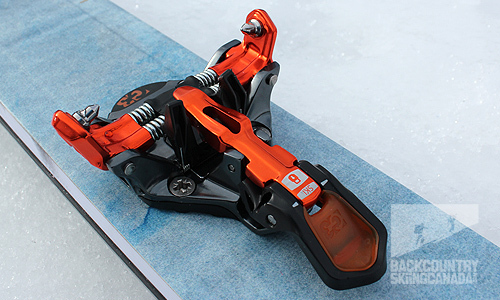 The heel piece is equally well designed and beautiful, again with a few new design improvements over other tech bindings. For the 2015/16 season the Ion comes in various versions: the Ion 10 has a 4-10 DIN, the Ion 12 a 5-12 DIN (which we are reviewing here) and a lighter, stripped-down version called the ION LT, which has no brakes but does have a DIN of 5-12. The LT version will save you 129 grams per binding over the Ion 12, but this does not include the weight of the leash you will need to use to prevent runaway skis and adhere to ski resort codes. The heel risers are stowed conveniently out of the way until needed. With a single riser engaged for moderate climbing. Both risers engaged for steeper climbs. - Optimal Energy Absorption: Minimized pre-releases. - Forward Pressure: Maintains consistent release values in landings and compressions. - Step-In Guidance: When the binding jaws are open, guidance tabs allow the user to accurately place their ISO 9523 boot toe for step in; the tabs retract when the binding is closed. - QuickFlick Heel Lifts: Easy to grab with your pole or hand. - User-Friendly Heel Rotation: Turn heel in either direction to lock for touring with either hand. - Single Tool: Pozi Drive #3 for all mounts and adjustments. No heel spacer needed. - Snow Clearing Channel: space under the toe wings is large enough to fit a ski pole tip in, forcing snow and ice out, this is a common cause of unwanted tech toe releases. - Powerful, Dependable Brake: Fully retracting spring-loaded brake. Reassuring step-in. - Heel AFD: Consistent release for all boots, independent of sole type. - Industry-leading Jaw Retention: Stronger springs in the ION toe jaw mechanism allow the binding to be skied aggressively in the unlocked mode. 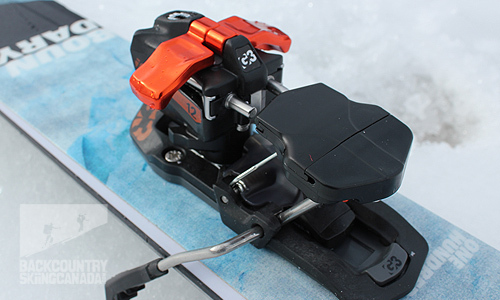 - Wide Freeride Mount: A wider, 40 mm footprint in the toe unit screws is 30% wider than the traditional pattern, for better leverage with wide skis. - Bi-Directional Heel Rotation: The heels can be rotated in either the clockwise or counter-clockwise position for touring. A close up view of the toe piece pins engaged. And similarly on the heel piece. A good 90° extension on the toe piece allows for true freedom of movement on the skin track. Before I talk about how the individual features of the Ion 12 performed in the field, I just want to say that the aesthetics and industrial design of the Ion 12 are unsurpassed by any tech binding currently on the market at this price point. 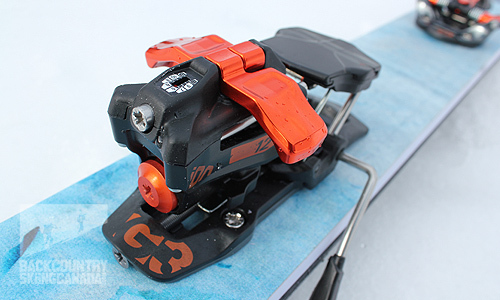 At roughly $570.00 Canadian the Ion 12 is a good value for a tech binding. When you take the 30% exchange rate savings into consideration for you U.S folks out there, the deal becomes even more attractive. In the field, the toe piece functioned perfectly. I found the initial step in to be effortless thanks to the boot stops that guide your toe into the perfect place for the pins to engage. This is similar to how the Marker Kingpin operates, but very different from the Fritschi Vipec, which has a much longer learning curve in order to master the step in. 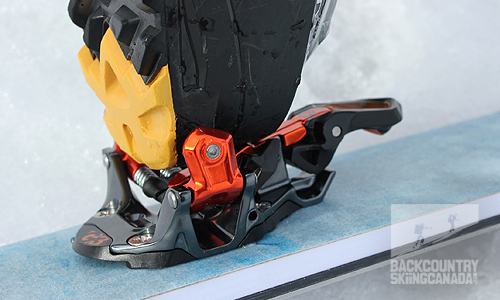 Also, unlike what I have experienced with the Plum Guide bindings on warmer days with wet, heavy packing snow, the Ion 12’s toe clearance make the build-up of snow a thing of the past. As for the heel, not only are the risers easy to engage and disengage, but their symmetrical design and ‘build upon’ functionality require no thinking to use: Flip one up for the low rise position and then flip the second into action from the opposite side to increase your heel rise even further. The heel piece rotates 360° in either direction so there is no dedicated low riser and high riser, either will perform each action depending upon which way you rotate the heel pieces. Some people like to always rotate their heel piece from their left or right side for consistency. I prefer to rotate the left heel by turning it left and the right by turning it right. No matter your preference or compulsion the Ion 12’s will work for you. There’s also a quick flick method to easily rotate the heel pieces back into ski mode after you’ve peeled your skins (ideal for those who are able to keep their skis on while they remove their skins). You can view this maneuver in the video above: it involves prying the outer edge of the heel piece with the grip end of your pole. A little pressure and the heel piece easily rotates back into ski mode. No bending over or hands required. I find this move pretty slick and useful for speedy transitions. It works particularly well with G3’s new poles, as they have a generous hook on the grip end that provides more leverage where you need it. The G3 Ion 12’s, like their predecessors, are designed to accommodate fore and aft movement as your ski flexes. Other bindings, specifically frame bindings, create a dead spot on the ski between the toe and heel piece where the ski cannot flex underfoot. G3 solved this problem by allowing the heel piece to essentially float, so that when the ski flexes under compression the heel piece actually moves back a minimal amount to accommodate for the shorter distance between the toe and the heel piece. A spring applies constant forward pressure to the heel piece relative to the mounting plate so that the release values are maintained, and a constant and safe release can be achieved if required. Other tech binding manufacturers simply rely on built-in heel play to allow the ski to flex with your boot, simply sliding on the heel pins. While this design works it is by no means as effective and compromises not only performance but safety. 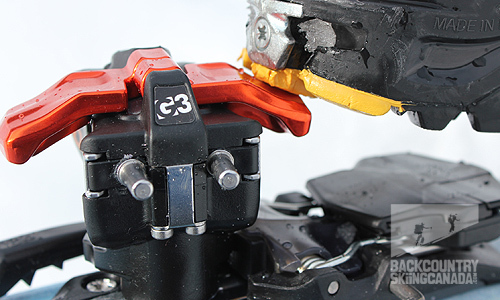 Another advantage that the G3 Ion 12 boasts over other tech bindings is their 30% wider mounting pattern. A wider binding mount means a better transfer of energy to the ski, especially if you're running a 100mm+ ski width under foot. 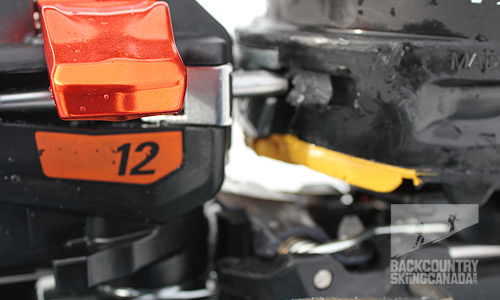 The bottom line for this reviewer is that the G3 Ion 12’s are solid, lightweight tech bindings that I would highly recommend for dedicated ski touring and occasional resort days. 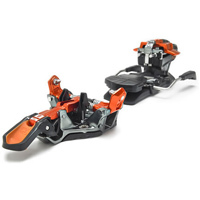 For more binding reviews, including frame alpine touring bindings, head over to our binding review page located here and to read a review of the G3 Ion LT 12 Bindings click here. Not sure that the Ion can take abuse from a heavier or more aggressive skier that likes to charge at the resort (not me) so not sure this qualifies as a quiver of one binding.